Thanks to reader Tuco for the heads up on Damon Hack's New York Times story about an interesting new tempo device. There's also a video segment on the story narrated by Hack, who clearly missed his calling as an NPR reporter. Grober has created an instrument that gives a player an immediate response to the golf swing. A smooth, rhythmic swing with Grober’s sensor emits a pleasing tone. A herky-jerky motion lets out a wail. To create the sound of a golf swing, Grober used Musical Instrument Digital Interface technology that combined instruments like the piccolo, the oboe and the French horn. The music — an audio interpretation of the swing itself — is transmitted wirelessly to the golfer through a headset. Grober, whose product is scheduled for release in January, said he has worked with 200 golfers and teachers on his invention. 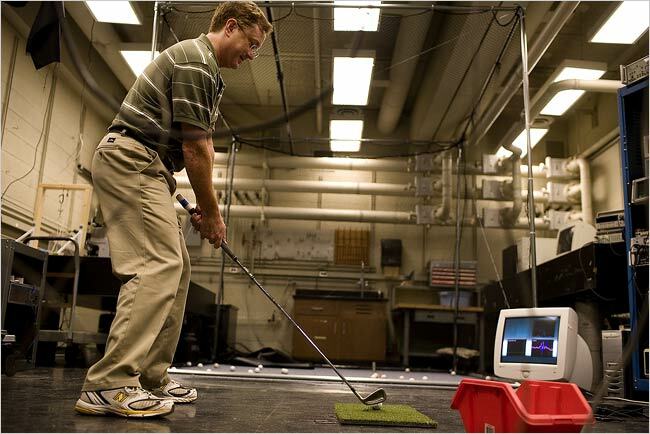 While the technology is new, the idea of using physics to teach a golf swing has been around for decades. Ben Doyle, who wrote the foreword to Homer Kelley’s popular instruction book, “The Golfing Machine,” said he could see benefits in a golfer being able to listen to the sound of the golf swing.